Figure 1. Stability of Fidelity Systems' AL10A as compared to commercially available 5'-Amino Modifier C6 at ambient temperature. 0.3 M solutions were prepared with CD3CN and sealed in NMR tubes under a blanket of argon gas. Values were determined by integration of 31P NMR peaks. Figure 2. 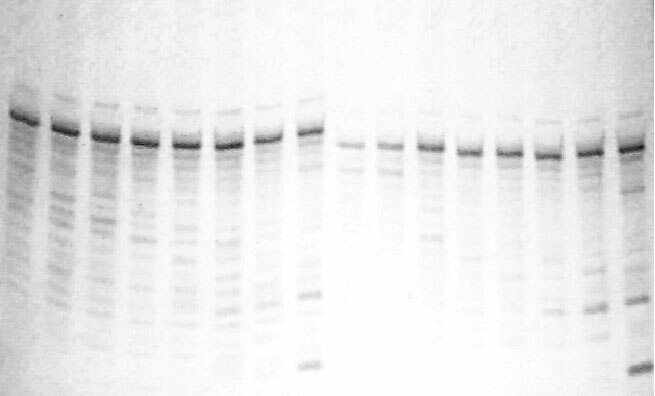 Crude amino modified 22- and 21-mer primers prepared with AL21A after a 30-day sitting on the synthesizer. The coupling conditions were: 0.1 M AL21A, 10 min, and 5-ethylthio-1H-tetrazole as the catalyst.